You would think most hammocks are the same – they hang above the ground like a swing and you can lay on them to let the wind rock you to sleep. But there are lots of different types of hammocks! Which one is right for you and your family? 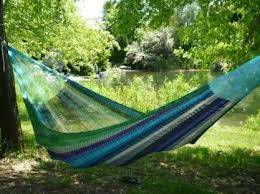 Spreader Hammock – A spreader hammock might be what you think about first when thinking of a hammock. The two defining characteristics of a spreader hammock are the long wooden bars and thick rope, giving the hammock a bed like appearance. 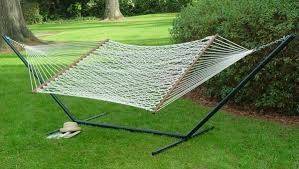 To use this hammock, you have to lie directly in the middle of the hammock or else you might tip over! Spreader hammocks are great for pools, backyards, or anywhere you like to relax. Non-Spreader Hammocks – Non-spreader hammocks don’t have the spreader bar. These types of hammocks typically include Mayan, Brazilain and Nicaraguan Hammocks. When used, they fold up like a cocoon, and the woven cotton fabric makes it a comfy place to sleep. They are great for indoor and outdoor use and are colorful additions to any part of your home! 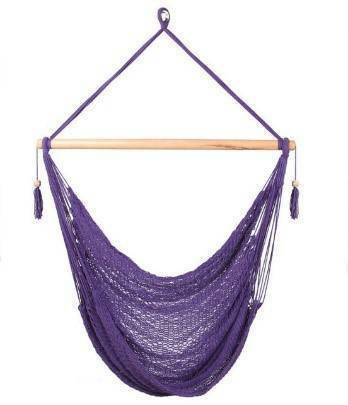 These hammocks are perfect for someone to add a little cultural flair to their garden or patio. 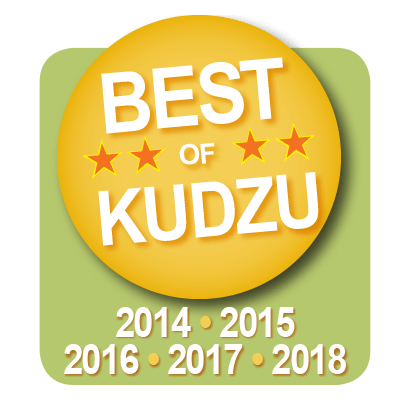 Camping Hammocks – Camping hammocks are designed for easy carrying, installation and removal. They are light to make them portable on hikes. Some have mosquito nets, while others can become a tent. Some can be hung in trees, while others come with a stand. Camping hammocks are great for people who love to relax in the great outdoors, but hate the complications of making a tent. Chair Hammock – Chair hammocks are smaller than regular hammocks, and are typically made for one person. They can be used indoors or outdoors for a fun way to seat your guests. These are great for people who love to read or enjoy time to themselves. Hammocks are a great way to lounge around and enjoy your backyard to the fullest. But how can you relax if mosquitoes are taking over your nap time? Squash them with Mr. Mister Mosquito Control and enjoy your rest again.